It’s been quite a month for celebrations at Golden Goose PR. Two weeks ago, we were recognising the remarkable bravery of women battling breast cancer at the Samsung Pink Ribbon High Tea and here we are, at the start of November, celebrating the achievements of some of Britain’s most inspiring women in business. 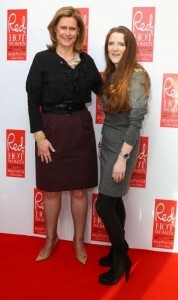 The occassion is the inaugural Red’s Hot Women Awards in association with euphoria Calvin Klein. And who are we here with? None other than Sarah Brown, the wife of PM Gordon Brown, Jools Oliver, Jo Whiley, Camilla Rutherford, Joanna Page, Faye Ripley and some truly impressive female entrepreneurs. The women we admire the most, from Natalie Massenet, the founder of Net-a-Porter, to Carrie Longton and Justine Roberts who created the hugely succesful Mumsnet are at Altitude 360, picking up a very lovely Red’s Hot Women plaque. Ethical businesses, city success and international achievements were all recognised and we lined up some brilliant press guests, from the Daily Telegraph and the Daily Mail to Closer Magazine, the Sunday Mirror, the Evening Standard and The Independent to witness their success. Already, coverage has been secured in all of those titles, plus the Daily Express and The London Lite, with the Sundays and the showbiz magazines lined up for the weekend and Tuesday. We wonder if we can enter in the media category next year? Having said that, this year’s winner, Katherine Viner of The Guardian, would be very hard to beat!